WARM -UP - 10mins of a gradually building up the players aerobic and anaerobic levels in preperation to the demands of forthcoming practice i.e jogging to start and build up of tasks &apos;turning&apos;dribbling at pace until plrs are running at 80% pace also include dynamic stretching and ample drink breaks (water) . 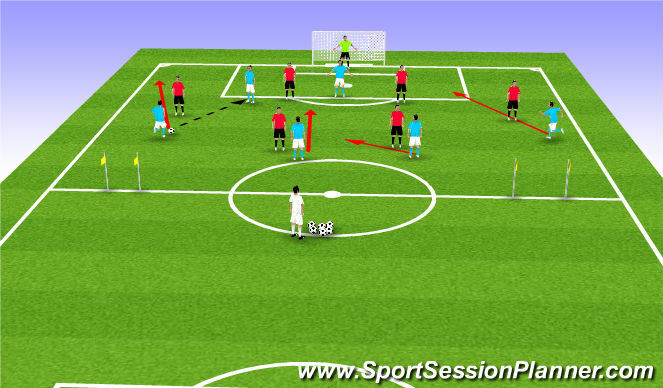 ORGANISATION - place 8 plrs at station A and 8 at station B also place four cones as shown on each side of goal/box all plrs at station A have a ball and their role is to dribble around set of cones nearest to them and around the more central one before attempting a strike at goal,on seeing the plr at station A leave the starting position the corressponding plr at station B runs as fast as he can around set of cones to their right and enter into goal area and attempt to stop the goal on completion of task plr who has the strike goes directly to station B and becomes defender and plr who attempted to save the strike goes to station A and will in turn attempt to dribble and strike on goal this will create rotation and all plrs can partake in both defensive and offensive practice &apos;the coach can use various conditions to increase tempo of task by timing each set and instructing plrs of no of touches they have before strike on goal after dribbling around central cone . 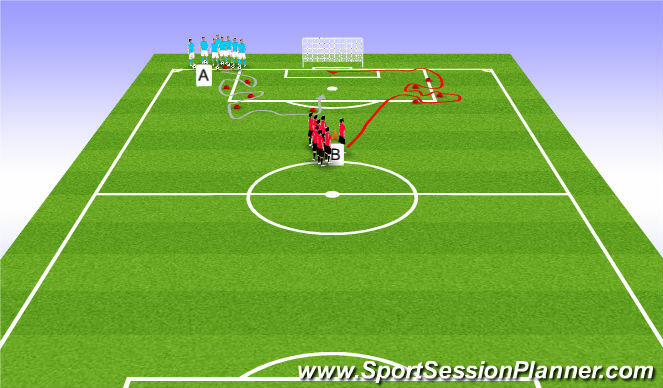 . .
SMALL-SIDED&apos; CONDITIONED GAME - organise two teams in a 6v6 formation with the defensive team to have a goalkeeper &apos;place a server on halfway and always start game from there the offensive team are instructed to get ball into striking areas and attempt a shot on goal, emphasise the realistic shooting areas and how to work as a team to achive this ie work on wide plrs crossing for strikers or strikers &apos;laying off&apos; for central plrs to strike from edge of box&apos;keep all game related aspects such as corners &apos;goal kicks and throw-ins you can award points for strike at/on target or correct build-up play with a strike at the end, the defensive teams goal is to keep possesion and build-up play from the back and score at either flagged goals on half way line &apos;allow both teams time as defenders and attacking team to demonstrate the principles involved in all aspects of play defensive and offensive . . . COOL DOWN -10mins of low intensity excersises and static stretches also include drinks . Q&A - between plrs and coach so as to ensure the plrs all understand the objectives worked on during session . . .